Throwback: An Bien Restaurant creates an ambiance reminiscent of life in Hai Phong in the old days. A couple who are passionate about Hai Phong have opened a series of restaurants that evoke nostalgia while enjoying the best street food found in the northern port city. Minh Thu eats down memory lane. An Bien is a restaurant that reminds you of life in Hai Phong before the Doi Moi (Renewal) period. It is a an ideal place for Ha Noi residents to sit next to a rustic wall and enjoy truly authentic cuisine from the port city. What impressed me first is the way the restaurant on Trieu Viet Vuong Street, Ha Noi, is designed, like a train, taking me to the Hai Phong I new in the past. The billboards, seen at all markets invite gourmets to come and enjoy popular dishes of the city. Meanwhile, the newly opened An Bien restaurant on Tran Thai Tong Street , Ha Noi, evokes the harbour with life buoys, hurricane lamps, fishing nets and boats used as decor. The owner of An Bien, Dieu Huong, said Hai Phong was her husband's hometown, and they shared a passion for the land and its cuisine. Slurping good: Bun ca (Vermicelli soup with fish) is a highly recommended dish at the restaurant, but there are many more. She said she wanted to create a place for anyone who loves Hai Phong, as well as people from there who are living far from home, where people can meet and recall memories of the city. She desired to introduce her guests to the most popular street food of the city. "I think we can feel and understand a locality through its culinary culture," she said. "Here, I expect foodies can imagine everything about the city just through a bowl, which is why I made the restaurant's motto 'Hai Phong in a bowl.'" With the aim to introduce Ha Noi the quintessence of Hai Phong's cuisine, Huong selects ingredients from Hai Phong such as fresh shrimp, crab caught from the Hai Phong sea and banh da (brown noodles) made in Du Hang Kenh Village. Huong also collected old photos, newspapers and books as well as photos of the city to create the atmosphere of Hai Phong in her restaurants. 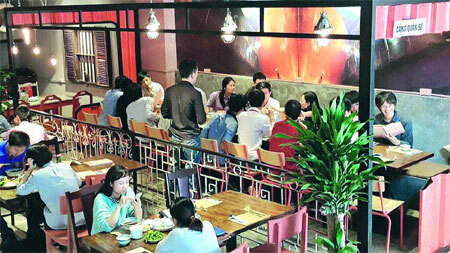 Hai Phong lovers may feel that they don't come just for the food, but also to enjoy the space and share nostalgia. As for the food, I would recommend the all-in-one banh da cua (brown noodle soup with field crab): giant chunks of crab meat, a handful of vegetables, fried fish, shrimp, cha la lot (pork wrapped in wild betel leaf) and fried beef balls. All are soaked in a stock cooked from pig bone and crab. Balanced meal: An Bien presents the most tasty and popular dishes of the port city of Hai Phong at affordable prices. Just one bowl can make me full. Although it's not difficult to find banh da cua in Ha Noi and other cities, An Bien is the only place serving diners the dish with chiu truong, the special sauce made by the ethnic Hoa people. 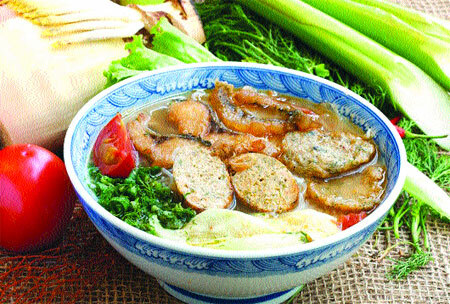 While other brown noodle shops often serve the dish with ot chung (chili paste), Huong decided to introduce the authentic taste of the dish which can be found in An Bien restaurants now. Chiu truong is made from chili, tomato, carrot and garlic in a secret recipe Huong wouldn't divulge. The kind of sauce doesn't just beautify the bowl - it really creates a wonderful pleasant smell and taste. Comments: popular street food from Hai Phong, with specific characteristics of the locality and an eye-catching look. Price is reasonable: VND90,000 (US$4.5) for a set menu for one person and VND60,000 ($3) for one dish. The restaurants are designed with impressive concepts. The next one we tried is another staple of Hai Phong street food: square spring rolls with sea crab meat. 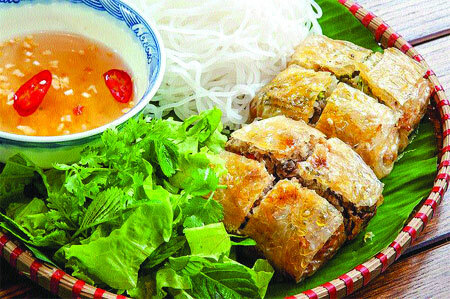 The stuffing of crab, pork, egg, vegetable, carrot and cat's ear mushroom is covered by crispy rice paper. The dish is so wonderful, and can be enjoyed with different kinds of herbs, rice vermicelli and a sauce mixed from fish sauce, sugar, vinegar, chili and water. We also tried assorted skewers with fried beef balls, chopped fish, sauteed shrimp, pork wrapped in wild betel leaf, grass carp, anabas and fish egg. Although we were full, we knew that a menu of 15 desserts was waiting and thought they couldn't be missed. Our waiter suggested thach gang (home-made grass jelly), which is very popular as a refresher. It's not just delicious - it's also healthy. The green jelly is made from gang leaves, which are available in the midlands. First you remove thorns from the foliage and soak the leaves in rainwater. Then you rub the leaves until they're crushed. Finally, the crushed leaves are mixed in water through a filter to discard the leaf pieces. The green water then will congeal into jelly. Traditionally, the grass jelly is topped with cane sugar, banana essential oil or coconut milk. Here in An Bien restaurant, it can be served with soy milk, black jelly and other mixed jelly, topped with ice, of course. I think it's more than perfect to end a meal in summer. For winter, An Bien serves che sui din (hot glutinous rice balls with black sesame, peanut and coconut), hot black bean pudding with fried breadsticks and hot soya custard with ginger.